Home» AP LATEST UPDATES | EDUCATIONAL PORTAL » AP RC.NO: 3320 Scheduled for School Management Committees (SMCs) Elections. AP RC.NO: 3320 Scheduled for School Management Committees (SMCs) Elections. AP RC.NO: 3320 Scheduled for Conduct of Election To School Management Committees (SMCs) ; AP School Management Committees (SMCs) Elections as per GO.NO:3320 ; AP RC.NO: 3320 Scheduled for School Management Committees (SMCs) Elections. 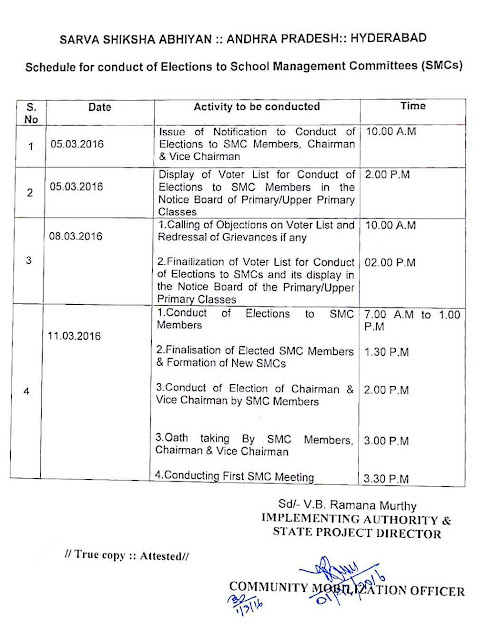 Scheduled for Conduct of Election To School Management Committees (SMCs) as per GO.NO:3320 ; AP RC.NO: 3320 Scheduled for Conduct of Election To School Management Committees (SMCs) ; AP School Management Committees (SMCs) Elections as per GO.NO:3320 ; AP RC.NO: 3320 Scheduled for School Management Committees (SMCs) Elections. Sub: AP Sarva Shiksha Abhiyan Scheduled for Conduct of Election To School Management Committees (SMCs) - Order Issued. Right of Children to Free and Compulsory Education (RTE) Act 2015. AP Right Of Children for Free and Compulsory Education Rules 2010 Issued G.O.NO:20 School education Rules Dated:03-03-2011. GO.MS.No: 130 School Education Department Dated:09-09-2011. Go.Ms.No: 41 School Education Department Dated 19-06-2013.